My ride today was actually one of the rides where I am visiting different churches in Kreis Viersen (I am trying to bag all 112 churches this year), but it turned out to be such an enjoyable ride I thought I’d do a short write-up now rather than adding lots of extra info to the page on the churches (which is still under construction). 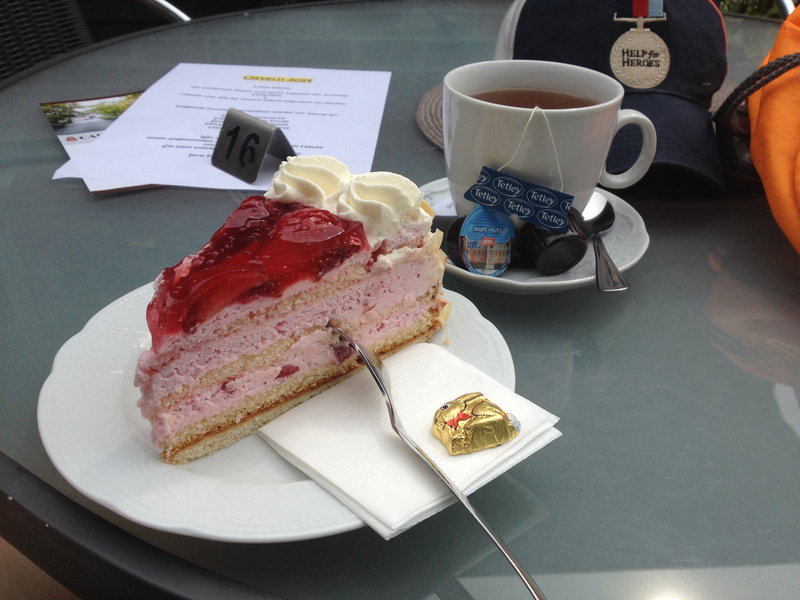 Today is Easter Monday and, being Germany, shops are shut – but cafés aren’t. 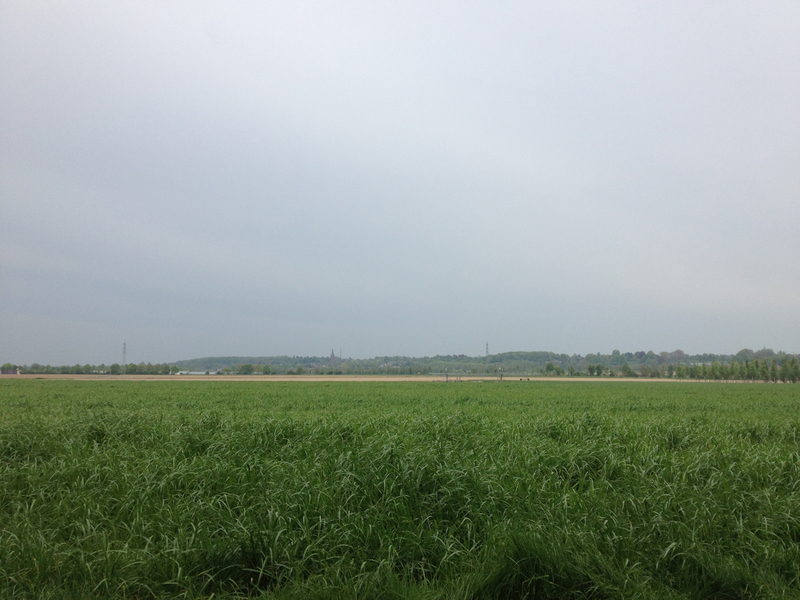 The weather was reasonable – about 18 degrees and hazy cloud but no sign of rain. The wind wasn’t too strong either. So after walking the dog and doing some work this morning I decided, at 11:30, to head out on Penelope and just follow my nose. For a change my nose took me due west towards the Netherlands. However I decided to try to bag a few churches on my list and so set my Garmin GPS to take me to Abtei Mariendonk, a monastery/cloister that I have visited several times before but not since I’ve moved to Kempen. I had a very enjoyable fast (downwind!) 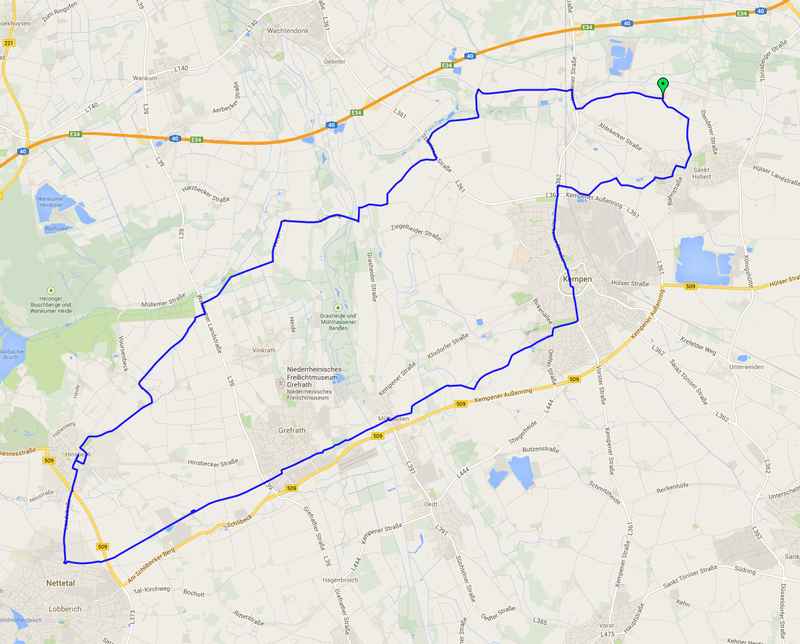 cycle to Mariendonk which is just four miles away or so. A few days ago a German chap contacted me through my blog as he lives locally (in Viersen) and rides a recumbent trike and realised that we will probably cross paths. I had a look at his blog (http://3-rad.blogspot.de/) and noticed that he cycled to Straelen just a few days before I went there – and on his way he visited Mariendonk. Hinter Grefrath liegt das Kloster Mariendonk. Von Ferne sieht das Gebäude sehr schön aus, es entpuppt sich aber dann als ein von funktionalen Gebäuden umgebenen Klosterbau… naja doch nicht so der Hingucker. Eindrücke und Informationen gibt es hier www.mariendonk.de. In other words… it looks nice from a long way away but is surrounded by rather functional buildings as part of the monastery. And here are the functional buildings where I parked. It all seemed very quiet and closed (although on a previous visit I spotted several nuns cycling out of one of the buildings) so I carried on. The initial plan was to head for another Church Waypoint on my Garmin at Vinkrath but I saw some signs to Hinsbeck, which I had visited previously and was a bit further away, and I thought that would be a nicer trip today. Hinsbeck is on a hill which is gentle one side and steep the other. Fortunately I was cycling up the gentle side so my speed didn’t drop much below 13kph. As I got almost to the top of the hill I looked across at Hinsbeck. It has two church spires – the Catholic Church is clearly winning the Tallest Spire race though! 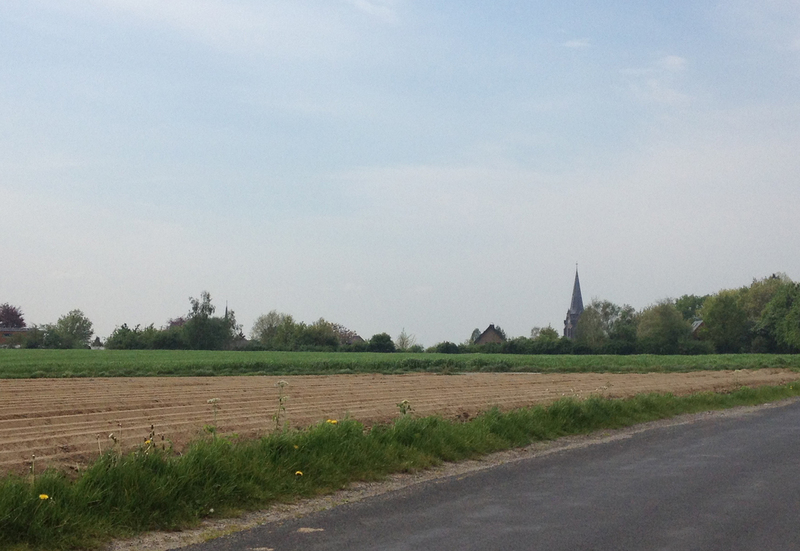 The spire of the Protestant church is just about visible in the trees on the left. The two churches in Hinsbeck are just a stone’s throw away from each other but it looked as though the route was easiest to go to the protestant church first so I headed that way. It was yet another modern building and yet another that I didn’t find particularly pleasing to the eye (not that it matters when you’re inside, of course). 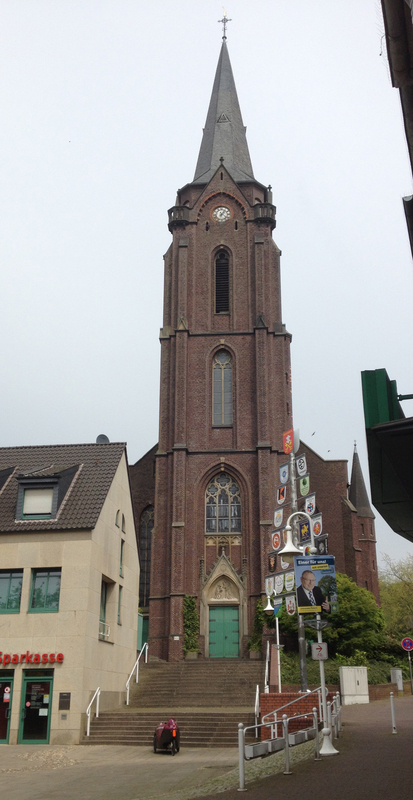 My (limited so far) experience of visiting churches in Niederrhein is that the catholics have good all the attractive tall buildings and the Protestants have concrete buildings that look mostly less than fifty years old and are generally tucked away in residential streets rather than being in the centre of town. I shall obviously research this a bit more as part of my Churches Challenge. 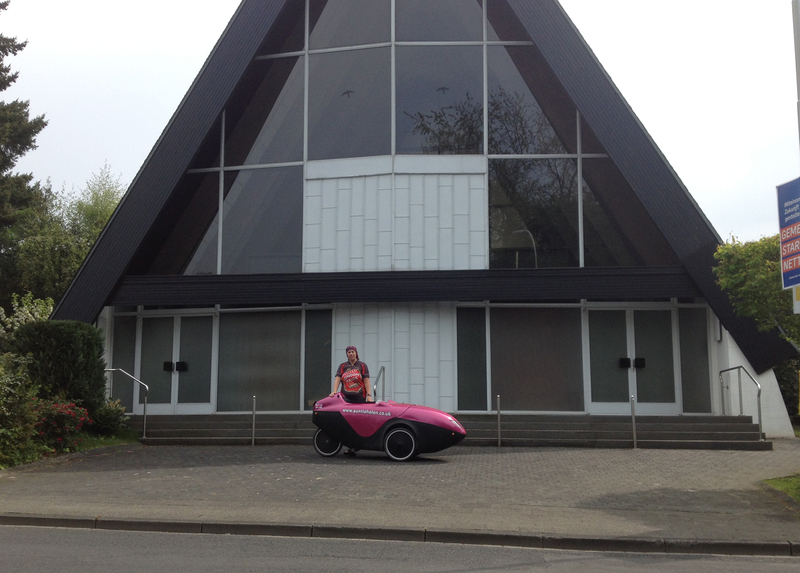 Here is Penelope outside the church. And here am I with Penelope. Clearly I didn’t take that photo myself – I accosted a passing couple and asked them to take the picture. Which they did. And then we ended up having a great chat for about three quarters of an hour. I was telling them about my Churches Challenge and about living in Germany and cycling Penelope, they were talking a lot about some of the beautiful churches to visit around here, a little bit about the history and more. It was really good to talk to Herr und Frau Herrmann, and they let me take a picture of them at the end. Time was marching on now and I was rather hungry, it being 13:30. 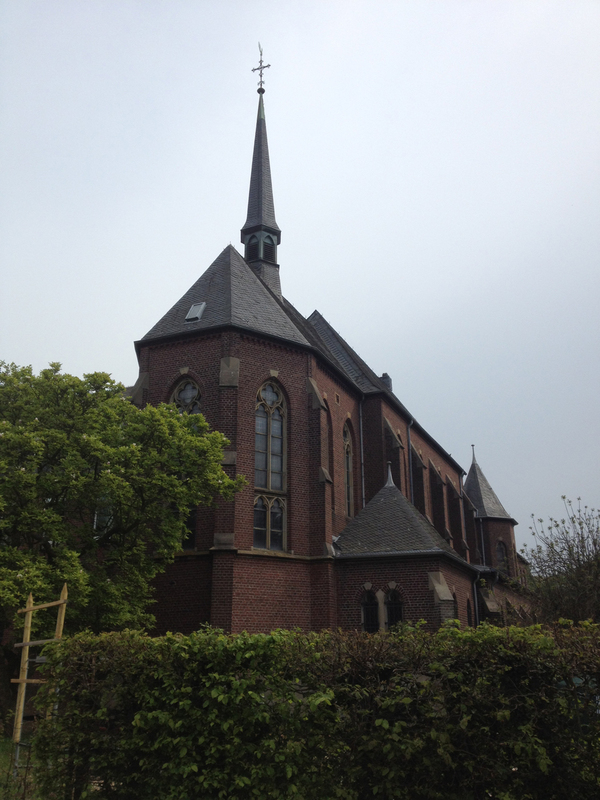 I quickly popped to the Catholic Church a few hundred metres away which was also shut/locked. There didn’t seem to be any cafés or similar open in the centre of Hinsbeck so I decided to start heading back and to get something in Grefrath. There is a quick route to Grefrath along a main road from Hinsbeck but I decided to take the Bahnradweg (disused railway line cycle path) instead which starts in Lobberich, at the bottom of the hill from Hinsbeck. So I whizzed down the hill, rode into Lobberich on a fast road, and found the beginning of the Bahnradweg. I spent ten days staying a mile from the centre of Lobberich (Nettetal) so am pretty familiar with this bit of the route – it was good to visit again! 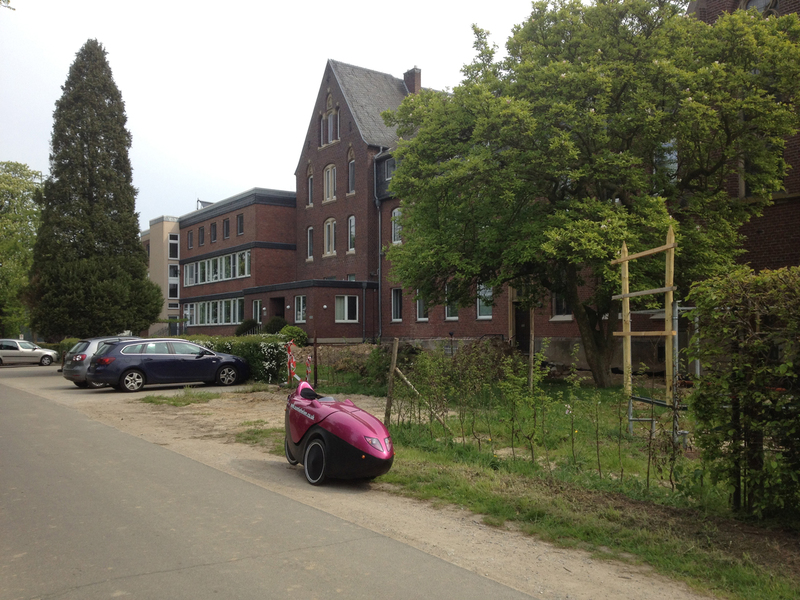 I joined the Bahnradweg which is generally a lovely smooth tarmac which allows a velomobile to go nice and fast! This is looking back at Hinsbeck with the Catholic church spire very visible again. 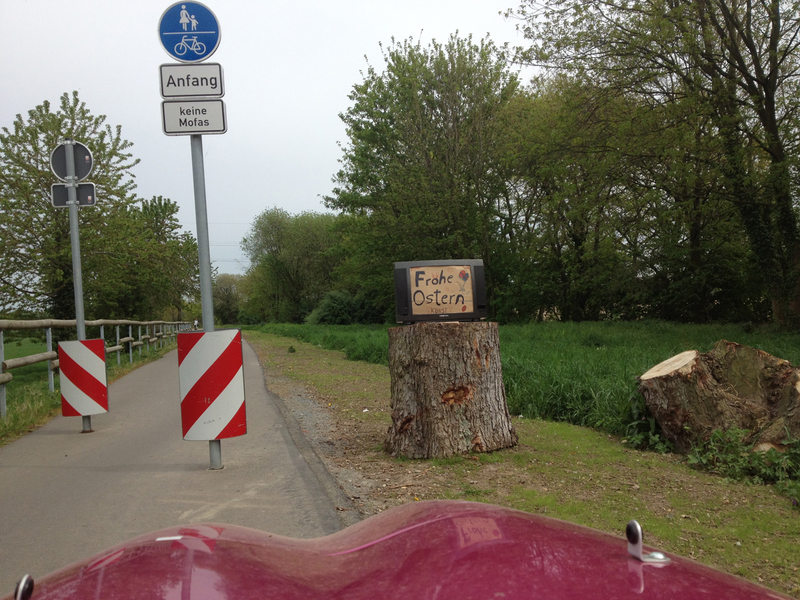 So I now started zooming along the Bahnradweg. I could get up a pretty good speed between the road crossings – at one point I was cruising at 45kph (that’s 30mph-ish). It felt good! I was also pleased to note that the fallen tree that had caused me an issue had been cleared away. One thing I did discover is that my hooter/horn thing, which is a very high-pitched squeal, is useless for warning people that I am coming. Most people don’t seem to notice it. I like to make some noise so they know I am passing and don’t get too surprised when the Purple Peril passes them. I need to investigate an alternative hooter – it looks like various things are available on Ebay for not too much. Perhaps I will find something at SPEZI Radmesse on Saturday (a bike exhibition for weird bikes and their various accessories). Anyway, I was getting hungry now and wondering if I would find anywhere open in Grefrath when, rather fortuitously, I passed a sign for a café which was open on Easter Monday, right beside the cycle path. So I turned off and parked Penelope and went for some food. 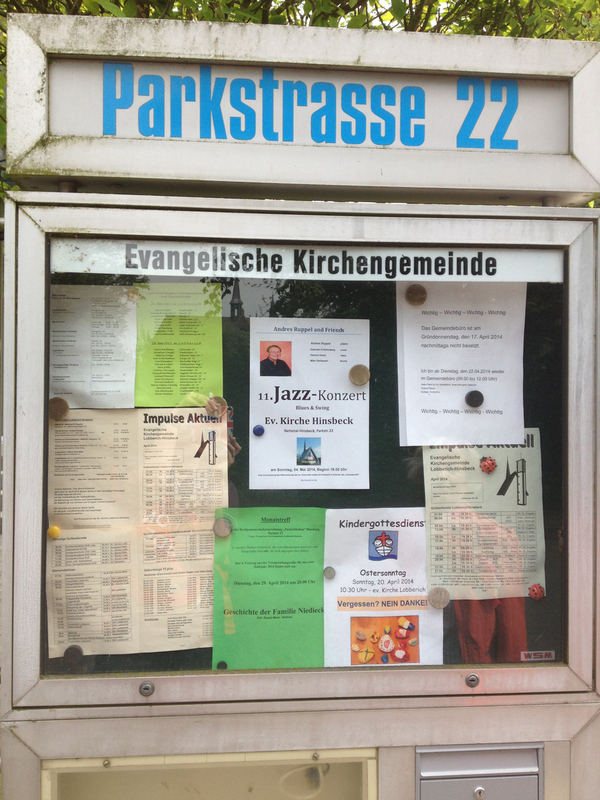 Then it was back on the Bahnradweg, past this piece of Easter Artwork which was on a television. After Grefrath the Bahnradweg isn’t as good – the route is more twisty (presumably the railway was rather more dismantled) and there are some ruts in the tarmac because of tree roots, but it was still a very enjoyable ride despite being into wind. 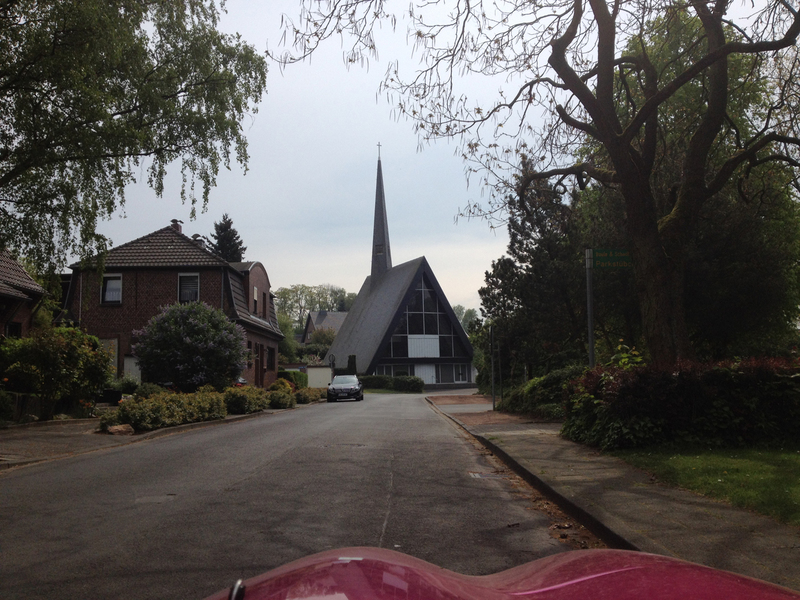 I arrived in Kempen and decided to ride straight through the middle again – on the cobbles, of course. I stopped for a bit to chat to several people who all asked me about the velomobile – they all seem to assume I must have an electric motor in there. I have to show them it’s just my legs and they are all amazed. The next question is ‘how fast do you go’ and when I said I went at 45kph today (and that was on the flat) they are very surprised. When I say my average is 18kph (as it was today) they still seem to think that’s fast. In the UK that would not be considered fast at all! I decided to do a slightly different route out from Kempen rather than just running along the cycle path on the main road so I took a cross-country path. Which, it turned out, had a railway crossing. The barriers are always down – you have to press a button to request it to be raised. But, of course, the button was too high for me. So I got out, pressed the button and a real man answered and said something unintelligible and then the barrier raised and I cycled through. I went into St Hubert in the hopes of finding Café Poeth open so I could buy some bread but it was shut so I went home empty handed (but had some emergency french stick in the freezer, fortunately). 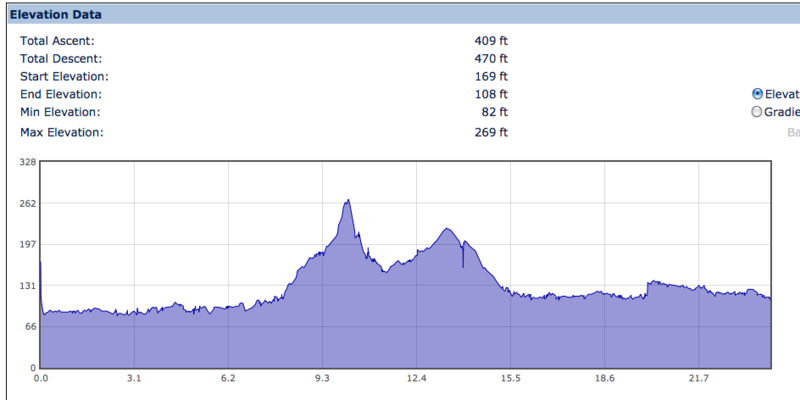 Today’s ride was 2 hours six minutes for 24.14 miles at an average of 11.5mph. Calories burned were 1,072 so the reduction in calorie burning of the velomobile (compared to Alfie the trike) continues. 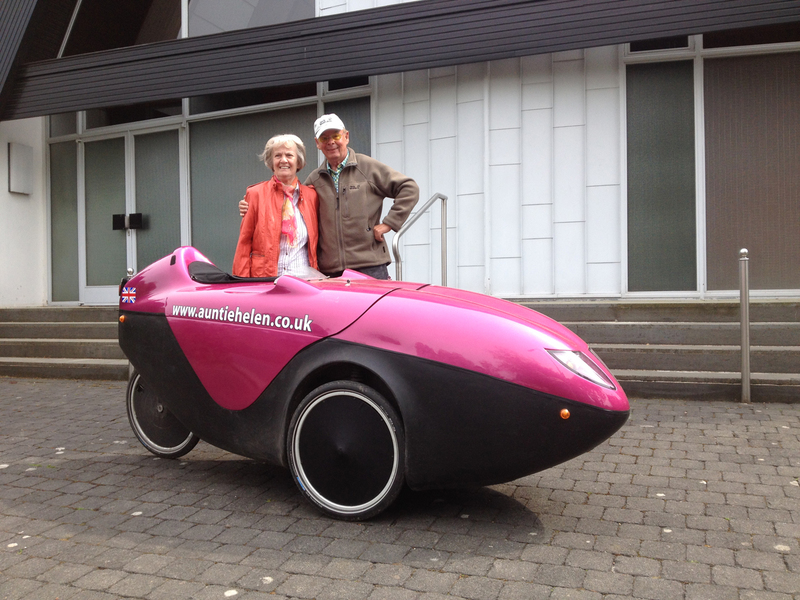 With a velomobile you’re always nice and warm, don’t get rained on, go faster… what’s not to like? The burning fewer calories seems to be the only downside so far! I have decided that I’ll only bag a maximum of three churches per ride so I don’t get to them all before the end of the year. It’s a great excuse to visit all the different parts of Kreis Viersen and hopefully I’ll find a few that are open that I can visit soon. Dear, you have bunked down in a part of Germany that is about as catholic as Spain – So if you want to see some nice protestant churches, I’m afraid you’ll have to look in parts of the country where the reformation got an early foothold. Thanks for your comment (and your previous message through my site – I tried to reply but I’m not sure if it worked as something weird kept happening to the email address). 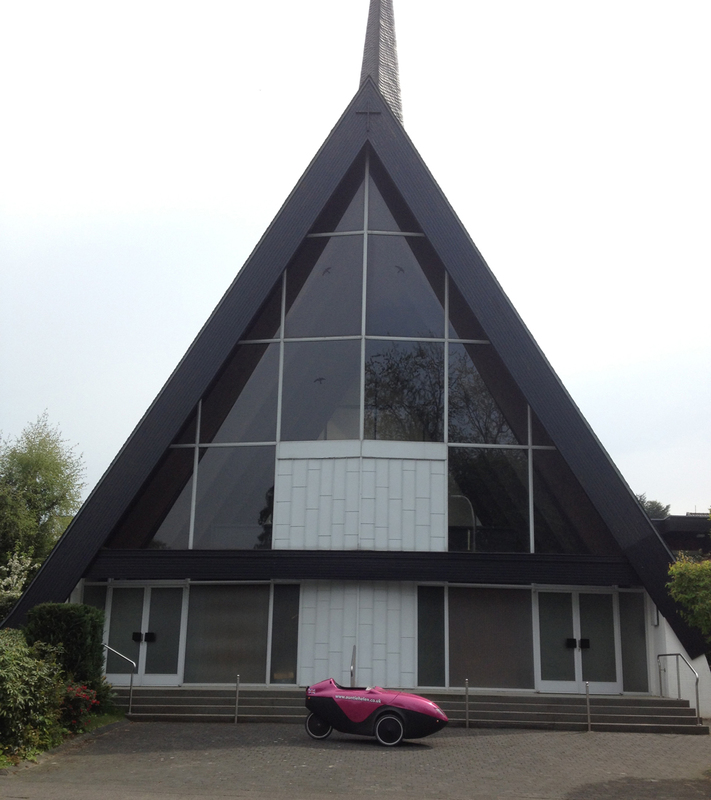 This part of the world is really suitable for the Velomobile. 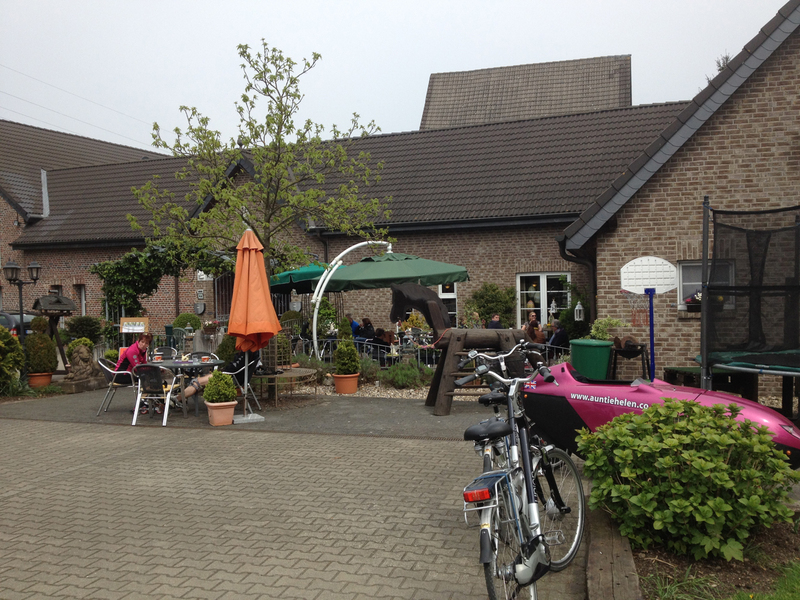 I find the facilities in Germany for cyclists very good – but of course I can also visit Holland for a change. Enjoy cycling on the KMX!